The spring came late this year. The winter rain kept the sun away when the plum trees needed the warmth to bring out the blossoms. Regardless, the hard-working bees pollinated the blossoms as much as they could. It looks like the trees promise a fruitful harvest in the summer. The top right photo is apples and the bottom right is plums. Just thought that I could relax to look forward to the harvest, I found out that the homeless and hungry cat has eaten three mourning doves in my backyard. The doves are not very alert. The cat hid behind the flowers and dashed out to the doves. I’m heart-broken and try to do my best to fence in some area for the birds. He’s behind a gate my neighbor installed to keep the dog in their yeard. The cat is flexible to go through any tiny area to get into my yard. Debbie’s Today’s Forgiving Fridays is about…Happy-ness! My plum tree is four years old. In March 2017, the tree was full of blossoms. Thanks to the hard-working bees, we had a prolific harvest in the early summer. I took photos of the plum tree in March this year, the blossoms were scattered. I was puzzling about the difference between the two years. Then I remembered that the rain came late this past winter. The air was still cold in February and early March. As a result, there was not enough sunlight to call out the blossoms. Only after the rain and a couple weeks of warm weather, the blossoms started to appear. The harvest this year may not be as bountiful as last year. We are thankful for the rain! This post was originally posted on March 11, 2017. I worried about the plum blossoms didn’t get pollinated. I was surprised by the visit of the bees and butterflies. Three months after I wrote this post, I’m happy to report that I got about 400 plums from two plum trees. When I went to my poetry class on Thursday, I took about 100 plums with sandwich size ziploc bags, asked the classmates to take some home. At the end of the class, all the plums were taken. I love plums because of the fiber content. I would like to dehydrate some plums. I ordered a plum pitting machine to take out the pits. I also found a recipe to use regular oven to dehydrate the plums so that I could keep them longer. All I have to do is put the pitted plums in the oven with 125o to135o for 12 hours. I’ll check on them every hour. I’ve never done that, so I hope that it will work. I added the photos of the plums at the bottom of this post. This is my “52 Weeks of Thankfulness” Week 2 at Haddon Musings. What an exciting week in my garden. I worried about my plum tree two weeks ago because it was the first tree to blossom after the rain. There was no bee attracting flowers close by the plum tree. 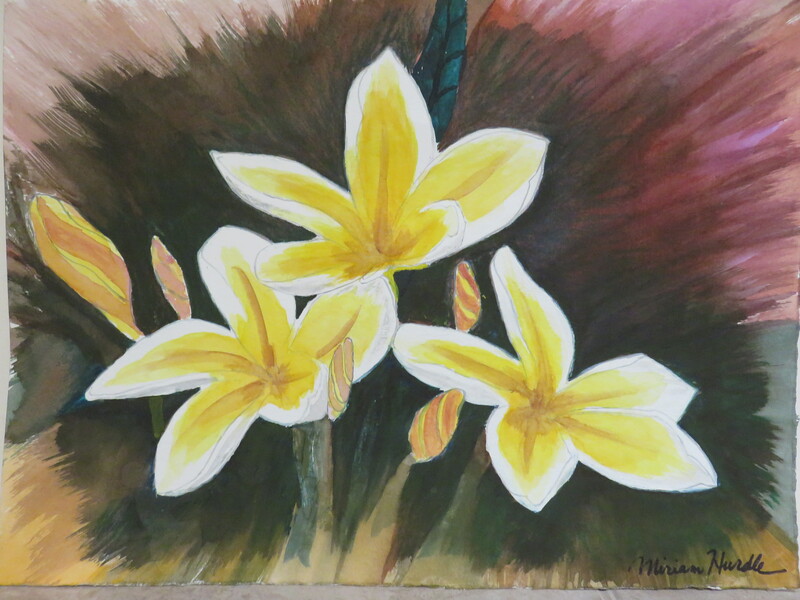 I manually pollinated the blossoms with a fine paint brush. The plum tree is against the retaining wall. There are different plants on the slope behind the wall. I climbed over the wall to look at the plants. I had some bee attracting plants on the slope last summer. Right now the whole slope is covered by clovers with fellow flowers. Somehow yellow flowers were not my favorite color. I started pulling them out to expose the ice plants with purple flowers, only to discover that they were dead. Before I got disappointed, there was a shocking surprise. I saw BEES. The bees hovered over the blanket of sixty feet wide yellow clover flowers. I almost wanted to plug the clovers back into the soil. Then I was thinking how to get some clovers close to the plum tree on the other side of the wall. First, I wanted to take a few photos of the bees. Suddenly, I caught the sight of some bees hovering over the plum blossoms also. Oh, how excited I was. I felt like the whole burden just fell off my shoulder. Now I could just leave it to the nature. Let the bees pollinate the plum blossoms. Yesterday morning as I was having coffee and doing reading in the backyard. I caught another exciting sight of butterflies hopping from flower to flower on the plum tree also. How thankful I am for the nature. How delightful I am to see the bees and butterflies in my garden this week. I’m so happy that the bees and butterflies brought 400 plums to my trees! Smorgasbord Easter Parade Blog Party – Part Two – Music, dancing, food, Behatted guests and time to drop your links. Miriam Hurdle grew up in Hong Kong where she went to college and worked for five years before coming to the United States. While in Hong Kong, she taught Chinese as a Second Language in Hong Kong Baptist University and the Chinese University of Hong Kong for three years. She was also the Director of Children’s Department at the Asian Outreach where she published four Chinese Children’s books. Miriam Hurdle came to the United States for her graduate studies. She received her master’s degrees in Christian Ministry from Portland Seminary, Counseling from Seattle Pacific University, and Education Administration from California State University, Los Angles. After teaching in California public school for fifteen years, she was promoted to a school district administrative position. She went on to do the postgraduate studies and earned her Doctor of Education in Educational Leadership from La Verne University in California. Dr. Hurdle continued in her administrative position for ten years before her retirement. In her retired life, Dr. Hurdle enjoys doing volunteer counseling, reading, writing, blogging, singing, drawing, watercolor painting, gardening, photographing, and traveling. Dr. Hurdle is married to Lynton Hurdle and has one married daughter and one granddaughter. I was featured on Yesterday After for my painting.